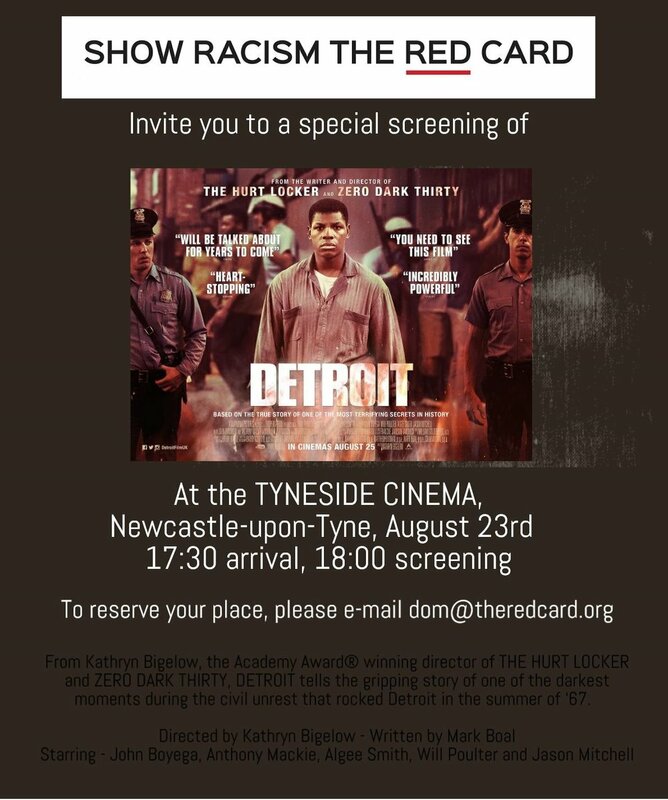 On 21st August and 23rd August, Show Racism the Red Card were invited to special screenings of Kathryn Bigelow’s ‘DETROIT’ in London and Newcastle respectively. DETROIT is based on true events. Amidst the chaos of the Detroit Rebellion, with the city under curfew and as the Michigan National Guard patrolled the streets, three young African American men were murdered at the Algiers Motel. ‘Hard hitting, gritty, dramatic, violent, uncomfortable, dis-jointed realism. All words that could be used appropriately in relation to Kathryn Bigalow’s most recent cinematic offering – Detroit. Re-telling the story of the Detroit riots in July of 1967. The movie at times was hard to watch due to the nature of the scenes depicted particularly the ‘up close’ violence of the pinnacle part of the re-telling of events that occurred at the Algiers Hotel. The subject matter seemed at times to be too large and varied for one film to be able to adequately cover, this was in part the feeling that one is left with, story threads opened but not completed, characters not explored / expanded in real depth. Limitation perhaps imposed by the limited reported facts from the incidents that occurred during the tumultuous time. This borne out with characters in the opening scenes (incident that lit the fuse for the rioting) not being followed up or followed through in the movie, at times it seemed that there were a lot of ‘also happened’ type moments which didn’t quite have coherence in relation to the rest of the story; again though, this could be due to the limited facts available from which the film-makers worked, however, there I was left with a definite feeling of ‘unfinished business’ in relation to some of the aspects. As a movie the film was as expected shot and photographed well, the leading actors portrayed roles that were believable and true. It would be unfair critique I feel on Kathryn Bigelow to focus on her being a white director telling essentially a story heavily relating to events in a predominantly black community as this certainly is a story that needed to be told and the question remains; who else was telling it? 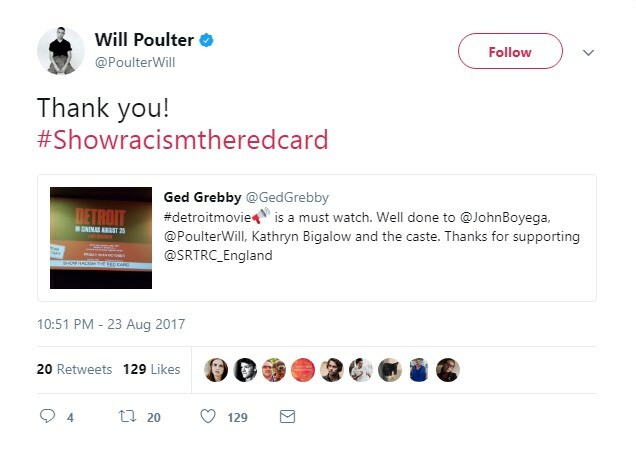 Everyone at Show Racism the Red Card would like to say a massive thank you to Entertainment One UK, and especially Zohreh Shahribaf, for all the support shown to the campaign.